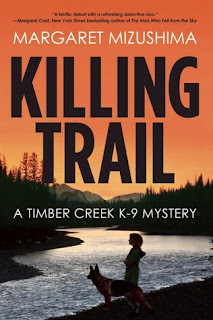 An intriguing police partnership and the rugged beauty of rural Colorado provides refreshing texture in this debut mystery, which shows real potential for an engaging, ongoing series. Officer Mattie Cobb is a newly-certified dog handler still looking to prove herself to her colleagues in Timber Creek, the town she grew up in as a foster kid. When she and her canine partner, a large German Shepherd called "Robo", uncover the part-buried body of a local girl near an old cabin in the mountains, ripples are created throughout the small settlement. Drug crime has been on the rise locally - hence the addition of Robo to the team - and baggies of drugs found in the dead girl's dog make it clear this scourge somehow ties into the murder. While this is Mattie and Robo's first case together, Mattie is an experienced young officer with an interesting relationship with her hometown. Thanks to her upbringing, she has plenty of trust issues and insecurities, and a mixture of familiarity and guardedness when it comes to the people in Timber Creek. From her colleagues and superiors to former teachers and local vet and single father Cole Walker, Mattie's often unsure of how to connect with or act around others, let alone who and how to trust. Being forced to let go of control a little and start to trust Robo and his superior instincts makes for an interesting character arc for Mattie. Other pluses are that Mizushima has a nice tough for evoking the small-town rural Colorado setting and crafting a pretty interesting cast of characters. Although the plot is a little straightforward, occasionally stumbles and skews genteel, and some dialogue can be 'on the nose' or overly expository, THE KILLING TRAIL is a good solid mystery and one that has plenty to recommend it. I particularly enjoyed the way Mizushima adroitly wove aspects of dog handling and animal care into the storyline; it always felt natural and not tacked on, yet the reader learns plenty about the special relationship between police dogs and handlers. Overall, a very solid debut that shows plenty of promise. I would read more Mattie and Robo tales. 3.5 stars for anyone, 4+ if you love animals and the outdoors.